I love my Yankee Scenterpiece all year round and I find it to be one of the best ways of filling my hallway with nice fragrances so how perfect does Home Sweet Home sound? It's a bit festive with cinnamon and baking spices and heartwarming with it's hint of freshly poured tea. I can't resist the crackle of a Woodwick candle and as much as Seaside Mimosa doesn't sound remotely Autumnal I would love it for bringing back memories of our honeymoon. Does anyone else hear about the Bath and Bodyworks candles and feel instant jealousy? We wanted to buy some in San Francisco but we just couldn't afford that weight in our luggage. I'd definitely have bought Hot Cocoa and Cream. Who doesn't want the scent of baking brownies around their house? Sticking to the sweet scents I was excited to see the Gingerbread House Tuscany Candle. Cosy vibes in an instant. 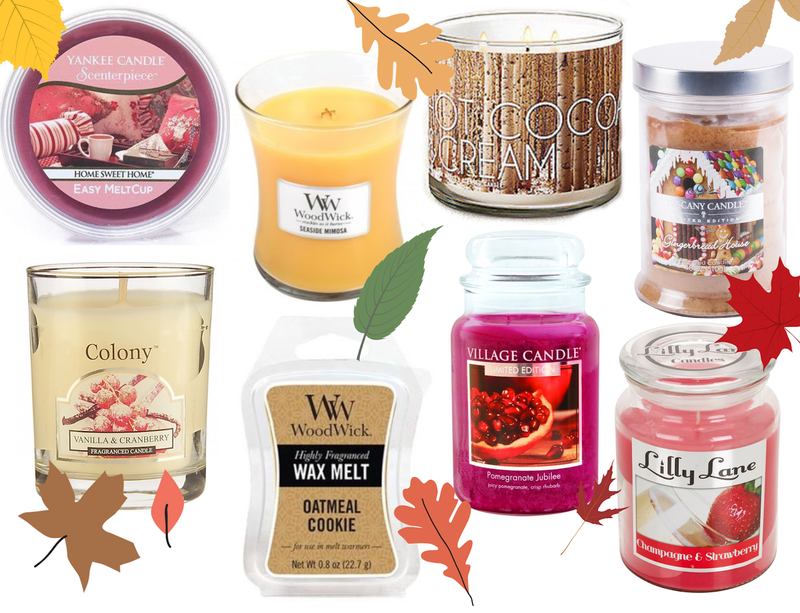 Vanilla has always been one of my favourite scents and the added cranberry of the Vanilla and Cranberry Wax Lyrical Candle makes it a little more Christmassy. Wax Lyrical Colony candles are affordable and have good scent pay off. I didn't realise Woodwick did Wax Melts but I instantly wanted the Oatmeal Cookie Woodwick Wax Melt. It's another one with a hint of cinnamon but it's the oats and almond milk that'll have my mouth watering and give me the cosy porridge morning feeling. My last two picks are fruitier scents and both have a gorgeous big jar. The Pomegranate Jubilee Village Candle is a rich looking colour with a hint of fizz and a crisp rhubarb scent. A scent that shouldn't be reserved for Summer is the Champagne and Strawberry Lilly Lane Candle - a glass of champers with some strawbs? Yes please.